When a city’s visitor center is located in a historic building (in this case, Curran Hall, from 1842), you can safely wager that the rest of the city will have its fair share of handsome buildings of historic significance and architectural grandeur. During my one day in Little Rock, I chose from among the eight historic districts to sample the Arkansas capital’s best buildings. These are my favorites. 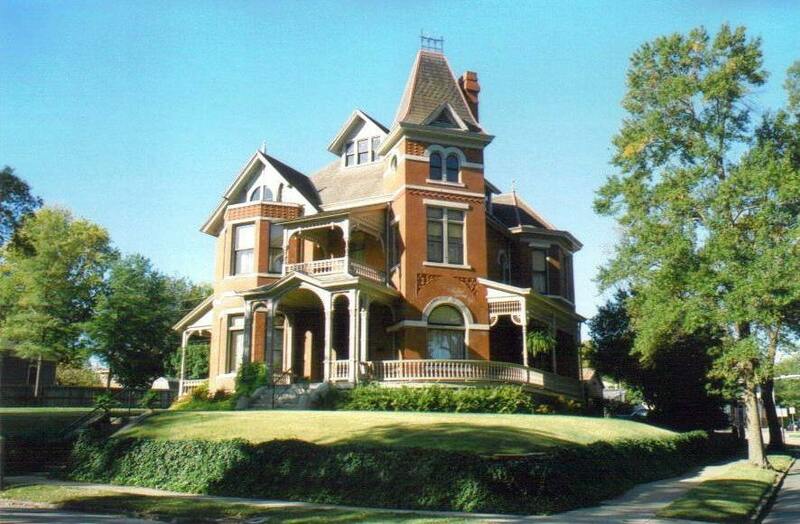 The Quapaw Quarter Historic District of Little Rock teems with gorgeous homes, and for as little as $149 per night, you can stay at the most stunning of them all: Hornibrook House, fittingly renamed The Empress of Little Rock when it was converted to a luxurious bed and breakfast in 1994, 20 years after it was added to the National Register of Historic Places. Completed in 1888 after seven years of construction for $20,000 (that’s about half a million today) for a Canadian immigrant and his wife, this corner property literally stopped me in my tracks during my stroll. The striking exterior drips with all the elements of flamboyant Gothic Queen Anne style: a three-and-a-half-story tower, wraparound porch with gracile posts, ornate chimneys, windowed gables, and the original iron fence and gate. Inside the 7,200-square-foot home, octagonal rooms, a stained-glass skylight, a wine cellar, and parquet floors of six different types of wood captured the opulence of the era. But Mr. Hornibrook and his wife didn’t enjoy their lavish residence for very long: He died in 1890, and she followed three years later. Over the following century, the house served a variety of less elegant purposes, including as the Arkansas Women’s College, a rooming house for women, a halfway house, and a nursing home. Now fully restored and modernized without compromising its historical significance, the Hornibrook House remains the city’s pre-eminent grand dame. 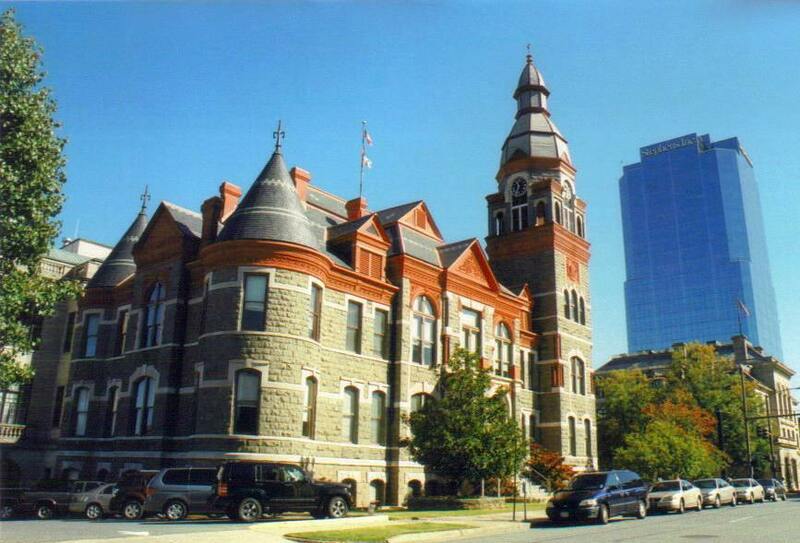 Two different buildings compose the Pulaski County Courthouse: a Romanesque Revival building from 1889 and a Beaux Arts annex structure from 1914. The former — the first permanent courthouse in the county — was designed by an alumnus of the U.S. Naval Academy with only a few years of architecture experience but who clearly had a knack and some natural talent for creating wonderful edifices. The imposing asymmetrical structure utilized materials from Arkansas almost exclusively. The facade is a collection of rich-textured stone walls, square and round towers with conical roofs, and ornamented red brick, including medallions and arches. A violent storm in 1961 destroyed the courthouse’s signature feature, its corner square clock tower. Prohibitively high costs prevented its restoration at the time, and a shorter tower was erected. Fortunately, a campaign was launched 30 years later to restore the tower, and in 1995, the building regained its architectural integrity when the tower, which rises 65 feet above the roof line of the rest of the building and features four identical clock faces, was unveiled. Another Quapaw Quarter gem that made it to the National Register of Historic Places, Ragland House features so many lovely elements that I wasn’t sure which was the one that attracted my attention first. Ultimately, I concluded that it was a collaborative effort. The color palette certainly engaged me: light and darker teal clapboard siding and shingles, yellow for the ornamental woodwork, and bold red chimneys with corbelling and geometric patterns. I loved the stained-glass transom windows on both levels of the two-story home as well as the waffle-patterned gables. A porch with a fine railing curves around the dominant corner tower, topped with a bell dome and a finial. 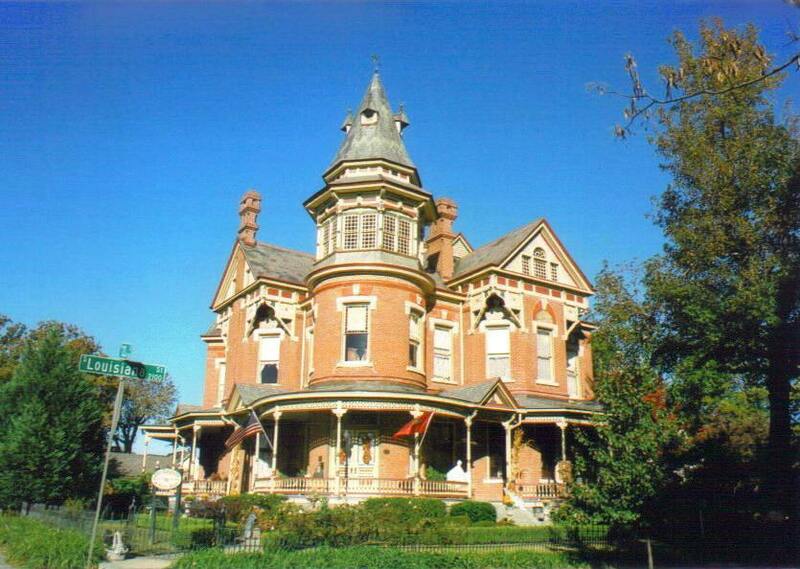 Built in 1892 for banker and stockbroker William Ragland and his wife, this Queen Anne beauty — an 11-room house with a wine cellar — remained their home for only six years, until they moved to Alabama and sold the house to her parents, and it stayed in the family for another six decades. The most interesting thing about Ragland House, however, turned out to be the fact that it was designed by an architect who was only 21 years old. Salem, Massachusetts, may have the House of the Seven Gables, but Little Rock has the house with seven porches, and I imagined myself spending each day of the week on a different one. 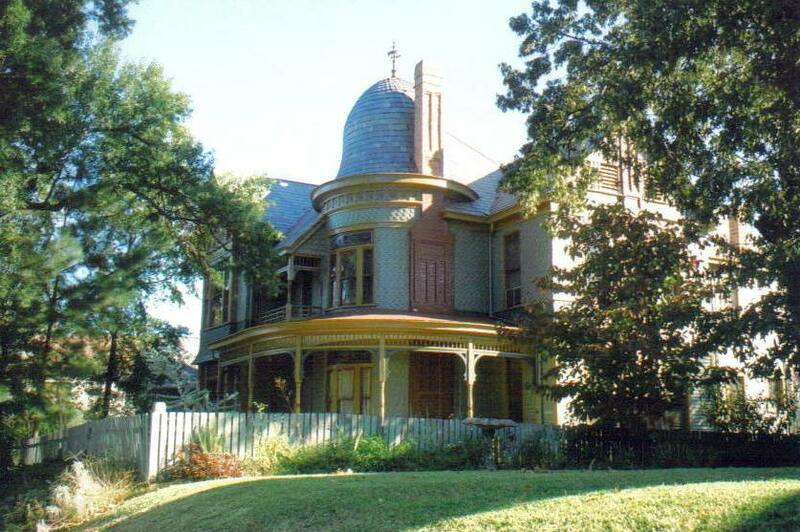 Dr. James A. Dibrell, Jr., a founder of the University of Arkansas Medical Department and its second dean, and his wife purchased the Dibrell House even before it was completed in 1892. Set in the Quapaw Quarter, the large brick home rests on a stone foundation, and its seven porches feature delicate wood railings and fretwork. The fenestration in the corner tower includes rectangular, arched, and circular windows, all with simple lintels. Thanks to his interest in the innovations of his time, Dr. Dibrell’s residence soon earned the moniker “the gadget house” when he incorporated such modern devices as burglar alarms, central heating, and doorbells. By the 1960s, the Dibrell House had been cut up into apartments, but it is now once again a single-family home, and the structure has been fully restored to its original plan. The neo-classical Arkansas State Capitol in the heart of the Capitol-Main Historic District gleams a bright white against the expansive green grounds in front of it and presents a welcome contrast to the bland buildings that sprouted up around it in the ensuing decades. The controversies and scandals surrounding its construction, however, made me wonder how it ever got built in the first place. Even with savings recognized through the employment of 200 state convicts, the capitol ran more than $1 million over budget, took 15 years to complete, and was plagued by scandals involving malfeasance, bribery, substandard products, and inferior workmanship. Construction began in 1899, but work halted in 1907 altogether, when both officials and citizens predicted it would become “the habitat of owls and bats.” The architect was replaced by the renowned Cass Gilbert (who had just finished the state capitol in Minnesota), and despite seemingly countless injunctions, lawsuits, and counter suits, work resumed and was finally completed in 1915. 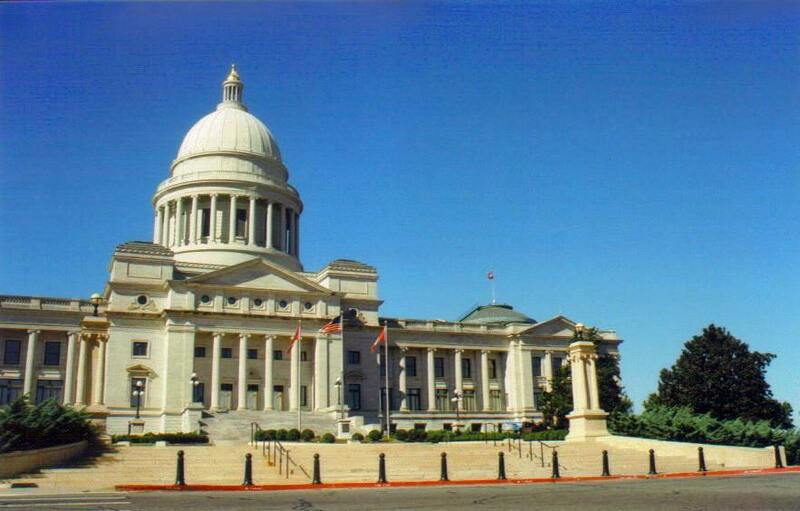 Like many other U.S. state capitols, this one features a broad central staircase leading up to a columned portico and dome. Inside, I admired the four murals depicting education, justice, war, and religion above the grand staircases leading to the Senate and House chambers (the only public art commissioned for the building); the marble figures on the sides of ornamental fireplaces; the 10-foot-tall bronze doors that are polished by hand weekly; the grand staircases of Alabama stone; and the impressive rotunda and the 4,000-lb. chandelier (with thousands of brass, copper, iron, glass, and zinc parts) hanging on a 73-foot chain from its ceiling.